While most of the action in Kingston seems to be on the Foreshore, the local shops shouldn’t be forgotten as a place with great breakfast options. A group of us went to Highgate Lane for a weekday breakfast and on arrival it became clear that they’re in business with Bittersweet Kingston, sharing seating and staff. There is a small breakfast menu just for Highgate customers, along with the full Bittersweet breakfast menu. 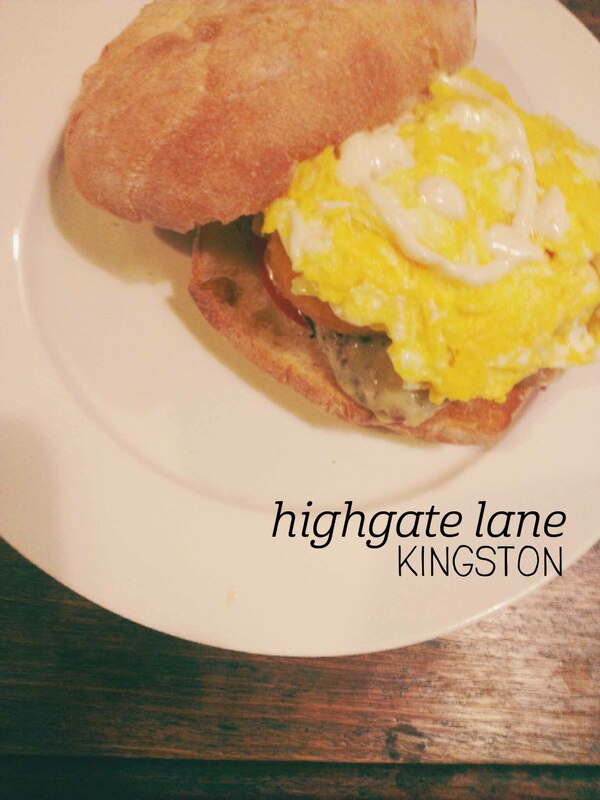 We opted for the Highgate menu, which consists entirely of ‘breakfast rolls’, and I was lured in by the promise of eggs, bacon, relish and… hash browns, on a roll! When the food came out it didn’t disappoint – the roll was more like a burger bun, soft but not too thick. The eggs and bacon were still hot and the relish added some real kick. But the best part was the hash browns – soft inside and crispy outside, they really made the roll something special. 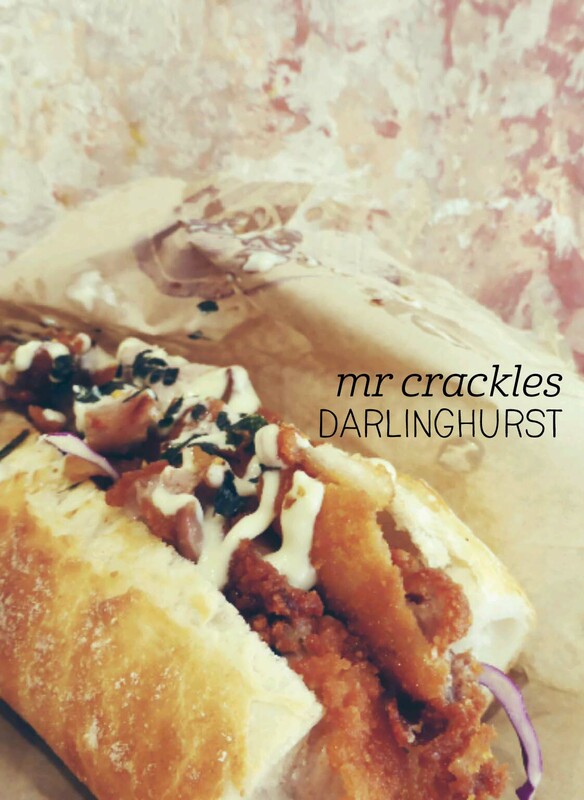 The cafe has a modern vibe, with solid wooden tables and exposed walls – bring a jacket though, with the laneway and centre doors open it can get chilly in cooler months. All throughout my university days and even now when I visit Adelaide, Bracegirdles is my go-to for a decadent treat. Their chocolate is my absolute favourite when it comes to boutique chocolatiers across Australia, and I think it’s at its best in molten form. 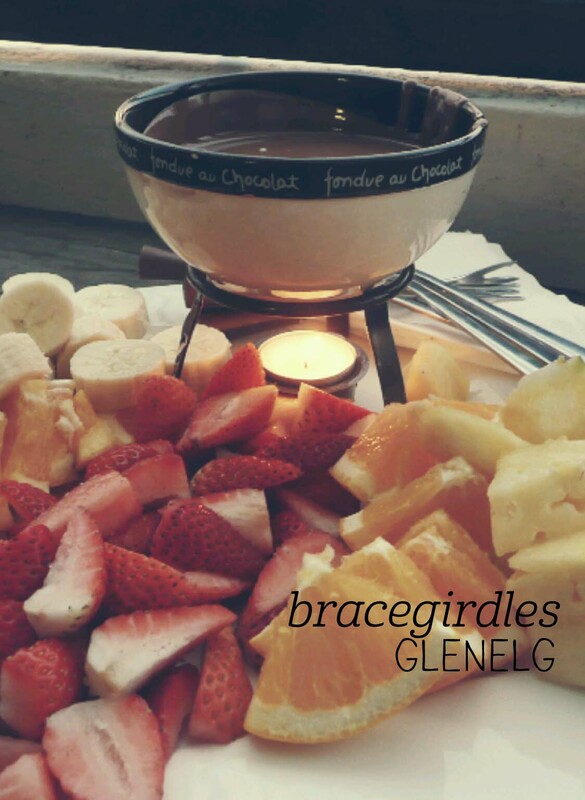 I don’t think I’ve ever ordered anything at Bracegirdles apart from their chocolate fondue – they offer a range of sizes with different accompaniments, but the ultimate for me is the fondue for four with fruit, shared with friends. You have a choice of milk or dark chocolate for your fondue. After ordering at the counter and admiring the range of truffles, there’s a cozy upstairs space with armchairs which is lovely in winter, or the balcony overlooking Jetty Road for people watching in summer. The plate arrives with banana, strawberry, orange and pineapple, all fresh and sweet. They do offer a lolly version for those with a really sweet tooth, but I found it a bit too much, as their chocolate is very sweet. One of the best things about Bracegirdles is that they sell their chocolate buttons for DIY fondue, so interstate visitors can recreate the magic at home. Love it. 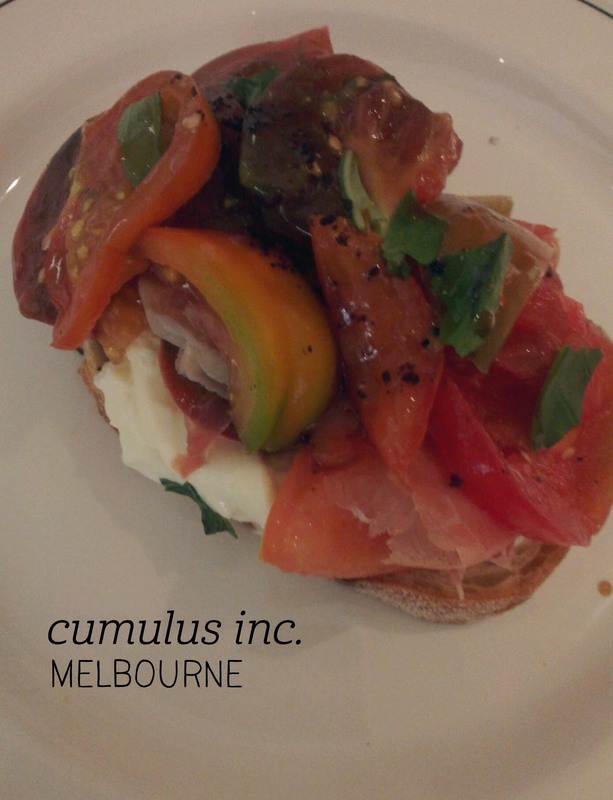 Friends had raved about the breakfast at Cumulus Inc when we were last in Melbourne, so on this visit I made it my first stop. Like Akiba in Canberra, Cumulus is friendly to the solo traveller, seating me along the bar overlooking the kitchen where I could watch the chefs bustling away. I started with a glass of berry lemonade, which was beautifully refreshing and had the underlying bitterness of homemade lemonade. The berries added sweetness without being sickly. I chose the heirloom tomato dish to eat, and added the optional Serrano jamon. The dish was perfectly presented, with the straciatella cheese layered under the jamon and the seasoned tomatoes. 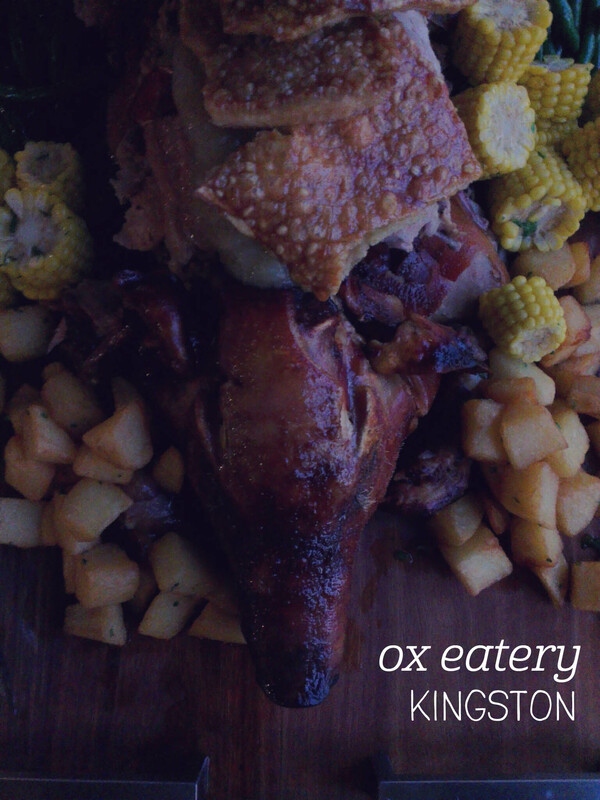 A perfect mouthful had a bit of each element, including the divine bread which added so much flavour to the whole. The cheese had a distinctive flavour that matched the tomatoes really well and the staff were happy to let me enjoy it slowly while I read my book. To finish I treated myself to a canelle, which was done in the authentic French style – an almost burnt outer shell with a soft and delicate inside. I now see what everyone has been raving about, Cumulus is all class. 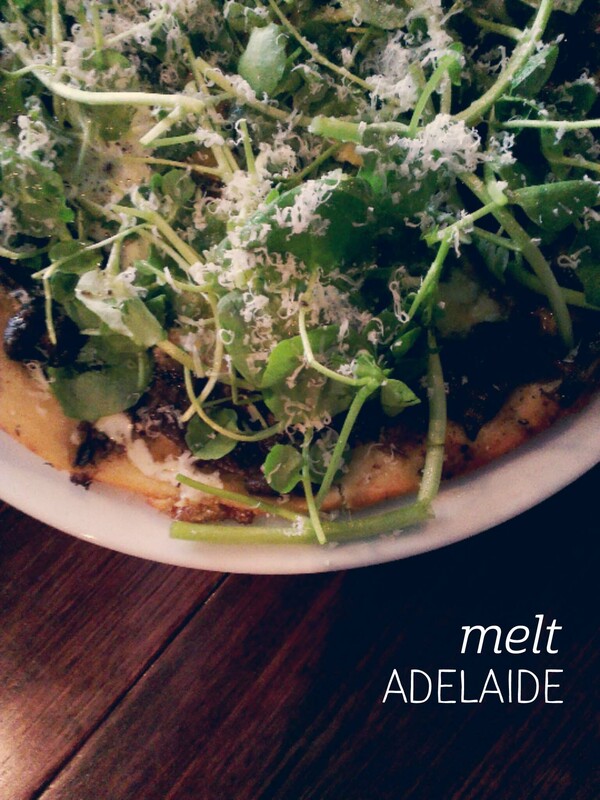 This was my second time eating at Melt, and it was just as good as the first at their other location on King William Road. The Waymouth Street restaurant has a green theme – it runs through the tiles, the website and even into the water jugs, which are packed with fresh mint leaves to make tap water refreshing. We opted for the CBD lunch special – a selection of tapas, pizzas and salads, and were amazed at the high quality of every single dish. The tapas included fried zucchini balls with an amazing mayonnaise, pan-fried haloumi, the best baba ganouch I’ve ever had and chilli green beans. This was promptly followed by three pizzas (between five people) – ‘albondigas’, with Spanish meatballs and cherry tomatos, ‘funghi’, with mushrooms, egg and watercress, and ‘the 38’, with zucchini, speck and mint. I’d requested ‘funghi’ as it was my favourite last time, but this time I was sold on ‘the 38’ – the flavours were perfect for spring and very fresh. All the bases were lovely and thin with just the right amount of crispiness. I absolutely expect there to be third, fourth and fifth visits here, at the very least. 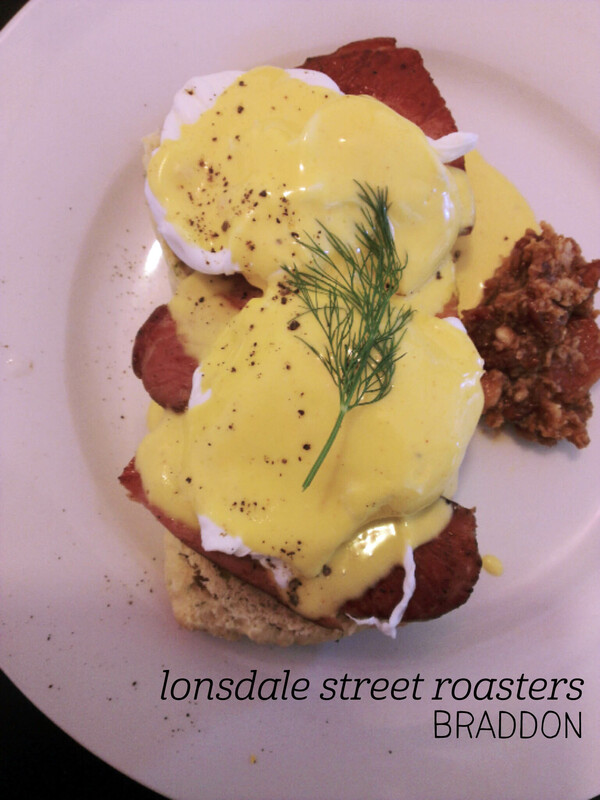 I have been a Canberran for a few years now, and until recently I had to admit that I’d never been to Lonsdale Street Roasters. Shock, horror. To rectify this, I met my Braddon-residing friends in the upstairs seating area of the original LSR (#7 Lonsdale St, not to be confused with #23 down the road) for breakfast. The space is surprisingly big and decorated with homely quirks – a TV set, a tricycle and big stripes of fluro pink paint. The breakfast menu is simple but has a good mix – I chose the eggs benedict, and both of my friends picked the ricotta hotcakes. I’ve said before that eggs benny is my test dish for a new place, and LSR’s interpretation passed with flying colours. Served on a savoury dill scone and topped with Pialligo bacon, the real highlight of this meal was the dollop? pile? of bacon jam on the side. I promise you, it’s not weird, it’s freaking delicious! The eggs were perfectly poached and whilst the scone base was a bit heavy, the dill cut through the creamy hollandaise. From all accounts the hotcakes were a good bite too. As a real Canberran now, I expect to be back soon!